To make my AlwaysOn demo up-to-date with latest release, I uninstalled SQL Server 2012 (a.k.a. Denali) CTP3 from my machine(s) and and started to install SQL Server 2012 RC0. Setup started fine and later after doing feature selection and then I received this error. Interestingly I didn’t receive error another machine both were made from same image. Here is the text of the error message for better search. Rule "Prior Visual Studio 2010 instances requiring update." failed. 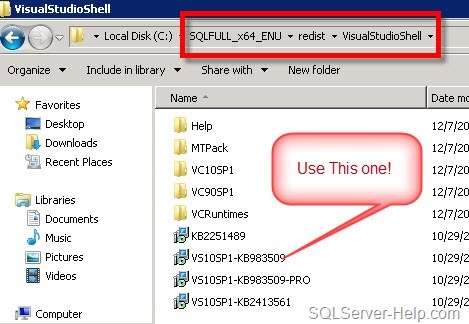 This computer has an installation of Visual Studio 2010 that requires a Service Pack 1 update that is needed for a successful installation of SQL Server based on your feature selection. To continue, install the required Visual Studio 2010 Service Pack 1 from SQL Server media or from http://go.microsoft.com/fwlink/?LinkID=220649. Here is the public proof of my theory from setup logs. You will also understand what all we check over here. (12) 2011-12-07 22:46:51 Slp: The package ‘VSIsoShellRTM_Cpu32’ is installed. (12) 2011-12-07 22:46:51 Slp: Rule evaluation message: This computer has an installation of Visual Studio 2010 that requires a Service Pack 1 update that is needed for a successful installation of SQL Server based on your feature selection. To continue, install the required Visual Studio 2010 Service Pack 1 from SQL Server media or from http://go.microsoft.com/fwlink/?LinkID=220649. DEV10RTMDetected is the rule name and it would fire only if you select BIDS and/or SSMS, we would fire the rule and block installation on failure. Now why it did not come on another machine because I didn’t select tools there. Okay, now you may ask – what I need to do now? Well, have a look at error message. It tells you the action needed. So here are the solutions. Once you start installing this patch, below is what you would see. This entry was posted on December 8, 2011 at 7:49 AM	and is filed under Denali, Error, Installation, RC0, screen shot, Screenshot, SQL Server 2012, SQL Server RC0, Visual Studio. You can follow any responses to this entry through the RSS 2.0 feed. You can leave a response, or trackback from your own site. Err – that info is in the SQL Server 2012 readme file. Hello, I gave it a try and it worked without any issue. Instruction is simple and easy to follow. I actually didn’t know that there is a setup of visual studio 2010 SP1 in the media. THank you very much. this is one big mess, im a developer with vs 2010 sp1 already installed. why do i see this message. this workaround doesnt work and no fixes out there as far as i can see. well done ms for wasting my money and my time. Thank you sir! The first option with downloading and installing SP1 worked for me! Thank you, this worked for me too! Thank you very much… It resolved the issue… Too good…. website and keep checking for new details about once a week. I subscribed to your Feed as well. I tried it several times and it is not still working…. This works for 2014 sql express edition as well. Grazie, è stato davvero utile. Thanks dear finally sql server 2014 installation success. i find the link for service pack 1, but the download file in no longer available.Where can i find it? Thanks! Worked like a charm. I appreciate you sharing your experience to the development community. Microsoft took away the download file! The link in the error is now bad. 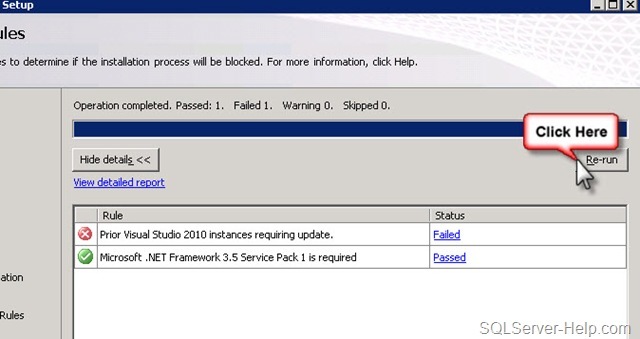 I have an MSDN subscription and you cannot get ( a valid ) SP1 for VS2010. The file in the folder did the trick!! I tried installing SP1 by two ways(installing Online and from Setup Media) you said. But nothing proved fruitful.